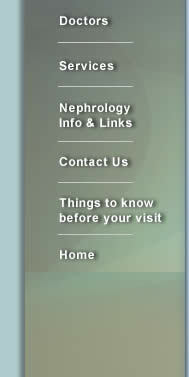 CKD or Chronic Kidney Disease includes conditions that damage your kidneys. Our physicians diagnose and provide treatment for people with conditions that cause CKD. Your physician may refer you to our office for hypertension (high blood pressure) which is one of the leading causes of CKD. We provide education of treatment options and our staff will provide information about dialysis and renal transplantation when your kidneys are not able to keep you healthy. Hemodialysis is a treatment that cleans the fluid and poisons from your blood. During a hemodialysis treatment, your blood travels through tubing to an artificial kidney or dialyzer where the poisons and fluid are removed. The tubes then return your blood without the fluid and poisons to you. Hemodialysis can be done in a dialysis facility or in your home after training by you and a family member by our staff. Our physicians supervise the care of people undergoing hemodialysis in dialysis centers in Lynchburg, Amherst, Altavista and Bedford. Peritoneal dialysis is a treatment that takes place in your home after a comprehensive training program in a dialysis facility by trained personnel. The training is supervised by one of our physicians. Peritoneal dialysis uses the lining of your abdominal cavity as the filter for cleansing your blood and your blood doesn't have to leave your body for this treatment. NHHD or Nightly Home Hemodialysis is a hemodialysis treatment that takes place in your home after you participate in a comprehensive training program. Our physicians supervise this program. NHHD is the newest treatment option offered by our physicians. Our physicians also perform follow up care of people that have renal (kidney) tranplants.